Found the note on my windshield last night. A 1993 Honda Del Sol with 200 000 km. For whatever reason I've actually always kind of liked the Del Sols. But I don't see myself making this trade. Maybe if he adds some cash in. Otherwise I'd say no go. Are you trying to sell? I thought I saw it on Kijiji. I've traded once - A Chrysler LeBaron for a Lada Niva. Fair trade. 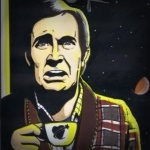 Arthur Dent wrote: Maybe if he adds some cash in. Otherwise I'd say no go. Are you trying to sell? I thought I saw it on Kijiji. Yeah - i have it up there for interests sake. Mostly I'd like to try something new this summer - Spitfire, TR6, Spridget, old Beetle, maybe something like a 924 or 944. But definitely something not dull. Ideally I'd get cash, and then start the search again. But sometimes interesting trade offers come through. One dude had a really interesting 67 Beetle he was interested in trading. Was pretty close to doing that, but then the guy vanished. So who knows. I think a del sol would be a step in the less interesting direction. Last edited by thewalrus on Wed Apr 01, 2015 3:24 pm, edited 1 time in total. I'd be pretty fine if I don't sell it, too. I'd pass on a Spriget unless you find an early car. They are rather fragile. The later ones are quite cramped inside. The Spitfire while still having issues is a much better car. How about stepping up to a V8. This might be a cool trade if you could swing it. Man, I've seen that GT6. I want it, bad. But I'd need to sell the MG first. I might shoot him a text about a trade - but I'd bet that he'd say no. On another note though - doesn't that seem awfully light for a GT6? I'm wondering if there's something wrong with it - bad accident, rotted frame, etc? The spare engine doesn't fill me with confidence either. Looks about right for a driver level GT6 to me. The stock wheels looked spray painted from a can for example. Fine for a driver but not a show winner. The large asking price ones never seem to sell. I won't worry about the spare engine - lots of Brit car guys have parts car or small amount of caches of parts. I sold my rust free Spitfire last August for $2200 with a crappy carb, torn top and recent but ok quality paint job. Oh and how tall are you? GT6 are not for tall people. Haha - dude is actually interested in the MG. Just texted me back. This could be interesting. For the GT6 the biggest issues are rust and a slightly weak gearbox. Its 2L engine is very similar to the TR6. Parts will be a little more than your MG but the mechanical bits are still cheap. Be on the look out for any missing GT6 specific bits especially any missing interior bits. Anything in common with the Spitfire is cheap and easy to source. They are super easy to work on. Interesting - I was just looking at Hagerty, I didn't know the GT6s were that much less pricey than the TR6s. Something about them made me think they must be worth more money. this car used to smoke crx del sols. stock. well, mine did. multiple times. mine was blue. but i've heard white cars are faster? what? everybody knows red cars are faster. tut wrote: this car used to smoke crx del sols. stock. I saw the Honda S660 and thought of you, Wally. The CRZ wasn't quite right but the S660 seems like a great combination of that car's good bits and the MGB. we're not getting it over here. Swerve wrote: I saw the Honda S660 and thought of you, Wally. The CRZ wasn't quite right but the S660 seems like a great combination of that car's good bits and the MGB. I know, right? I just read a good article about it - looks incredible. But, like Talon said, we're not getting it in North America it seems. Not sure if it's just because Honda doesn't think it'd sell, or whether it's because the S660 doesn't meet some ridiculous North American requirements. If it's the former, Honda should take a page from Ford's book and realize that North Americans actually do like, and will buy, cars originally intended for other markets. This isn't the 1990s anymore, where everyone and their dog only buys overweight, overpowered, ungainly and poorly styled vehicles. I currently drive an MGB for fun. What on God's green earth makes you think I'd be buying its replacement for straight line acceleration.